Can you imagine viewing the face of someone who witnessed the Revolutionary War? It seems far fetched doesn't it? Not to mention distant and long ago. Now imagine a child who has little sense of time viewing that picture and imagining the world of possibilities as they create in their mind a story of the birth of the United States. What an incredible way to spark the curiosity of children and adults and give the Revolutionary War and its witnesses a living voice! Maureen Taylor wants to bring the face of the Revolutionary Era to a documentary. Not long after, Judy Russell, CG, author of the Legal Genealogist blog, presented a challenge offering to match the donation of the first 50 contributors with a $5 pledge of her own. Please read Judy's post to learn her story and why this was so important to her. I don't want that momentum to fade! I am willing to provide a $5 match, just as Judy did, for the first 40 people who become a backer for the Revolutionary Voices Kickstarter project. All you have to do is donate $1 minimum and I will provide a $5 match. Then leave a comment on this post or send me an email and let me know about your pledge. After 40 people contribute at least $1 to the kickstarter campaign I will contribute another $200 to the project. Some people have been having fun with their pledges. Maureen mentioned that she had received a pledge for $17.76 and another for $1776. Now that's getting into the spirit! Do I have the extra money just lying around to do this? No, not really. But this kind of project is important to me. Life is a participation sport and this is the kind of legacy I want to leave behind. I want people to say "Marian helped with that!" and "Preserving history is the kind of thing that Marian got passionate about!" Add in a mix of old photographs and the Revolutionary War and what could be more perfect and meaningful? I hope you'll follow Judy's inspiration and help me contribute even more to this project! Is there anyone after me who will take up the mantel after my pledge drive is done? Let's keep the momentum going! Big News from Legacy in 2013! So far 2013 has brought good things and lots of exciting news. The latest BIG news, from Legacy Family Tree, is that their webinars are now available 24/7. I'm a big supporter of Legacy Family Tree webinars and not just because I'm a speaker. As someone who has a young, active family I have a hard time getting to national genealogy conferences. In fact, I have never been to one. When Legacy started presenting webinars they provided an alternate way for me to get continuing education via the internet right from my home. I can watch a webinar with five kids running around, screaming and playing and no one is the wiser! I really appreciate that. Just this week Legacy Family Tree has introduced Legacy Family Tree Webinars - a new site and a new approach to watching webinars and learning about genealogy. The webinars are now available by a monthly or annual subscription. The subscription allows you to view webinars anytime and from anywhere (as long as you have an internet connection) as well as accessing the accompanying handouts. The cost of the subscription is $9.95 monthly and $49.95 annually. Currently there are nearly 100 webinars available for viewing. And you can still purchase individual CDs if that is the route you prefer to go. Yes, you can still watch the webinars LIVE for FREE. That hasn't changed. Nor has the great door prizes that Geoff gives away each week. This is really the best of both worlds. Free for those who like to watch live and instant access to all webinars for those who like to watch at a time more convenient to their schedule. For more information see the press release from Legacy Family Tree. The Houstory Scavenger Hunt begins today! There are $500 worth of prizes including a CD copy of my "Plan Your Way to Research Success" webinar. For instructions on how the Hunt works watch this video. 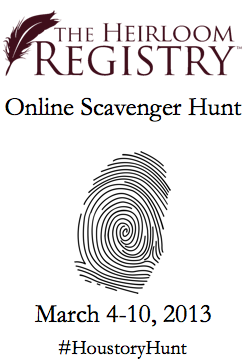 If you’d like to start the scavenger hunt now, go to The Houstory Hearth blog’s special Scavenger Hunt Page. There you’ll find information about the hunt, the prizes, and the list of the other three blogs you’ll need to visit today. If this is your final stop for Hunt No. 1, be sure to submit your entry form with your secret words before Tuesday, March 5, 2013 at midnight PST. Instructions for Hunt No. 2, which starts on March 6, will be posted at The Houstory Hearth blog at 12 a.m. EST on March 6. Good luck—and happy hunting! Visit an earlier post to learn how I used the Heirloom Registry to record one of my heirlooms.